Ladywell win at last...but we're quids in! at City of London Academy all-weather pitch, Bermondsey. Not the strongest of sides that "The Rabblers" have ever fielded, in fact for this hastily arranged friendly we couldn't even muster eleven genuine starters, which was how seriously most of our squad, of twenty five or more on paper, took this match! Though of course we are grateful to Phil Baker for arranging it, and offering the venue free of charge, thus putting some much needed funds into the team kitty, which in truth was what the match was really about. Raising funds first & foremost, rather than getting a result, though a win would have been nice! Having said that it would be churlish to take anything away from Ladywell, who managed to scrape a winning goal in the near darkness of the closing minutes of this encounter. "Chaps, just a reminder of the address of the pitch for tonight's game, plus map link, which is hopefully below. Kick-off 6:15pm at the lastest." The match did not commence until half past six, & it was clear this was going to be a truncated match. Which was just as well, as we could only muster ten players. Well, nine plus one 'guest' player, with a friend of Ian Gannon-Jose Munteanu-making his debut for us. 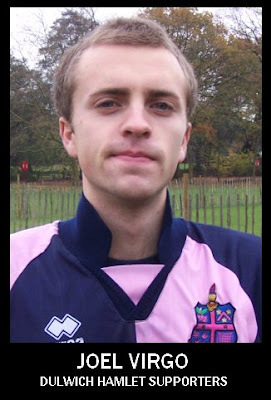 Which was a bonus for us, a he bagged a hat-trick for his first appearance in the famous Pink 'n' Blue! But we were soon on the back foot, going a goal down early on, after the defence appeared somewhat static in the box. Moments later Mark Hutton retired from the field, suffering from a virus he is trying to shake off, and promptly threw up on the touchline, to take no further part. Ladywell sportingly offered us one of their number to even things up, and the match continued with ten against ten, rather than eleven versus nine. We fell further behind when Dawn Taylor swung at a clearance, but failed to connect, and they shot and scored. But to be fair to Dawn she had another decent game, working her heart out, despite not being fully fit, suffering from bruised ribs, but gamely chose to play, which she did so, through the pain barrier. But mere minutes later Jose Munteanu bagged his first, knocking in a precision cross from Chris Garrett. After a very short interval, due to the evening darkness starting to draw in, it was "The Rabblers" who scored next, to even up the game. Following some skilful & tenacious play from James O'Shaughnessy battling down the byline, he knocked the ball across to Jose Munteanu, who was brought down just inside the box. Despite natural hesitation, Phil Baker had no choice but to blow his whistle, and Jose made no mistake from the spot. With the game flowing end to end, as much as a game of this 'calibre' can actually 'flow', it was "The Rabblers" who went in front next, for the first and only time. A long clearance from the back sailed over the halfway line, which Jose latched onto, took forward and placed the ball past the keeper. By now the Gaffer Mick O'Shaughnessy has deigned us with his presence, & his words of encouragement flowed. He saw that Dawn was struggling gamely on, & called to her: " You alright Dawn? You want to take a breather?" To which she quipped: "I'm fine, you got any morphine?". No such luck but he did offer her a whiskey! I hope he was a man of his word & treated her down the 'Queen Vic' afterwards! The clock was ticking, and the daylight fading when Ladywell played some simple, but rare exquisite football, with a number of simple advancing passes through the middle of the park, from which they equalised. The clock was now ticking, and the moon rising, as near darkness set in. But play continued, with Chris Garrett heading wide in front of goal, when it seemed to look easier for him to hit the target. As if to emphasise that he allowed time on for Ladywell to score the winner, with a header that Shaun Dooley failed to see in the darkness of dusk. Which takes nothing away from another creditable performance between the posts from him. Still we had one more chance to even things up,& with Jose pushing foward, he knocked the ball across to James O'Shaughnessy for our 'equaliser'; but at this very late stage it came as no surprise when Mr. Baker disallowed it for offside, having been 'not quite' in line, from the safety of the centre circle! Moments later he blew for full time, I assume it was him, as he had the whistle. I couldn't see through the darkness! And so at the end of a sporting game it was three cheers for the Hamlet, and three cheers for our victors Ladywell. But the only real victory was the coffers of the Dulwich Hamlet Supporters' Team, and raising the funding for a new set of socks! Hat trick man Jose on the ball. Hutty has left the pitch, he doesn't look too well. Or as a sympathetic Baker put it: "Feeling a bit sicky wicky were you?" with only the merest of grins on his face! Leaps like a salmon, Ian's up in the air going for goal. It's Lazarus on the sidelines! Jose scores from the spot. Well to be honest I haven't a clue who this bloke is! He swapped sides when Hutty went off after a few minutes. Whilst I'm sure everyone is grateful that he offered to turn out for us, I asked him his name and he said it was 'Datsun Cherry', which is what everyone calls him! I'd have preferred his proper name, to include on here, but oh well, if he wants to be a bit of a muppet that's his choice I suppose. And this was our other 'guest', Jose Munteanu, who was gentlemanly enough to tell his real name. Back row (Left to right): Dawn Taylor; Steve Rickerby; Shaun Dooley; Mark Hutton; Danny King; Phil Doyle. Front row(L. to r.): Ian Gannon; Dip Stick (guest); Jose Munteanu (guest); Chris Garrett; James O'Shaughnessy. for the lengthy delay in updating this blog over the last month. It's just something I do in my spare time, and is only one of a number of blogs I enjoy publishing. It does take a while to upload photos & things, and I have been concentrating on other sites recently. There are only so many spare hours I have, so thank you all for being patient-that is is you have even bothered to look in! Even if this site looks inactive at times be reassured it is continuing! Once again, thank you for looking in! Hope you're on the mend Joel! Joel was injured over a month ago, playing in the Monday Sevens, when he went down with a squeal, & in a lot of pain! e carried him off the pitch, and his mum & dad picked him up, before going to hospital for a check up. At first we thought it might be serious ligament damage, but hopefully, whils still a bad injury, it may not be so awful. I heard from Joel a couple of weeks ago & he said that he wasn't back at work yet, and had been advised to rest it. It seems there may be a piece of bone that's chipped off & is in his knee, but the doctors aren't quite sure where it's from! He is hoping to have a scan at the end of this month, but isn't sure when they will remove the bone. I'm sure everyone would like to send their best wishes to Joel, and if any of you are members of Facebook you can contact him via that site. Mick O'Shaughnessy has been the Gaffer of our team since Lawrence Marsh & Andy Tucker stood down after our last successful & popular mid-season tour, which was to Namur. Mick became the first 'Rabblers' manager to have his son play in the side, James having been a regular for about four years now. This was after David's debut, against JK Jalpallihagila; and he scored our goal against HJK Helsinki supporters' in the next game. Which earned James a fair bit of ribbing when we returned. So as not to make James feel left out I made amends after our match with the Corporation of London. Last season the vast majority of the squad were snapped, head & shoulders, either by myself or Jack McInroy, for posterity. One we never took was DAVID YUILL, who is a reporter with the 'Southwark News', whose debut was at the end of last season against Old Westminster Citizens, on the main Champion Hill pitch. This is MATT PIKE, who 'guested' for us against the Corporation of London, for the first time. He plays for Ladywell FC. Next up is another 'Snooze' man, Gavriel Hollander, who made his first appearance for us against the Corporation of London. And finally an old stalwart of ours, who's been around for a number of years, LUCAS GREEN. He just plays so rarely it's difficult to grab a photograph of him! On Sunday 22nd August we entered a team into a five-a-side competition, organised by the Kingstonian Supporter's Team. Well this Sunday morning at the outdoor small courts by the Kingsmeadow car park was one of them, as we entered a team in the Kingstonian five-a-side competition. All a bit of fun I know, and it wasn't that bad once it got going, but it was a farce from start to finish. I had, personally, gone along to watch, but was 'roped into' the squad the day before after late drop-outs. That I have no problem with. But the tournament cost fifty quid per team to enter, and if you were knocked out in the groups as we tends to happen to us, three X one seven minute game is not a lot of football for your money! Having to register at nine o'clock for a 9.30am start and then be on your way before lunchtime does not a great tournament make! To make matters worse, there were no other supporters' teams apart from the hosts, & their landlords from AFC Wimbledon, who both had a number of sides, so it wasn't even a genuine supporters' competition we were entering. Talk about being lulled across London under false pretences! And then-for the final insult-each team was allocated a country name to play under! We were called Italy, but make no mistake, we were Dulwich Hamlet Supporters' FC & ALWAYS will be! I, for one, hope we don't bother entering here again, if it's run on the same lines! Nothing against Kingstonian themselves, who are a great bunch, it's just not the tournament I think we all expected. Of out three games the first one was the one that made our day, so to speak. Up against an AFC Wimbledon side, we won by the only goal, thanks to James O'Shaughnessy hitting the back of the net. Next up were 'Austria', who ran out in a Fulham kit. but neither Germanic nor Cottagers were they. In fact a team from Metropolitan Police, which included two Ryman Division One South First Teamers, the rest being Suburban League players. Unsurprisingly they were far too strong, and outclassed us by three goals to nil. the last game, before we settled into the bar, was Poland, which was a mix of kingstonian fans, their backroom staff & mates who defeated us by the odd goal in three; Andy Tucker scoring out goal. Ian leads early on in the 'gurn of the season' competition! Talk about leave your marker behind! Shouldn't there be someone in Pink 'n' Blue to pass to? Back row(left to right): Mark Hutton(manager); James O'Shaughnessy; Shaun Dooley; Andy Tucker; Chris Wheeler. New opposition, albeit some old friends. We travelled to the all-weather pitch if the City Academy School, in Bermondsey, to take on the Corporation of London. Friends of Phil Baker, including Jim Barber, who has watched the Hamlet a number of times in the past, with his son. The City slickers looked exactly that in the warm up, having an extremely professional approach, compared to liad back warm up, of passing the ball about a few times, three and in, plus pre-match cigarettes for the smokers! In fact the Coporation had been undefeated for four seasons, which sounds impressive, but apparently some of their opposition hasn't been of the highest calibre, often challenging the 'might' of the ladyboys of Ladywell for a run out! So whilst not wanting to dwell too much on the match itself, not least because it was almost a month ago & I'm struggling to recall any of it, it is with great pleasure that I can belatedly report a superb 'Rabblers' 5-2 victory! And as if that wasn't 'historic' enough genuine 'Rabblers' records tumbled as we used no less than four different goalkeepers in this match! Taking turn between the sticks were Darren Nicolas, Lawrence Marsh, Ian Gannon & Steve Rickerby! It was good to see Lucas Green have a run-out on 'home' soil, living down the road, in Bermondsey itself. Though he still couldn't quite arrive for kick off! Goal scoring hero-with no less than a hat trick- was James O'Shaughnessy, who no doubt had a family point to prove, with his elder brother David having taken all the paludits from him, having scored our goal in Helsinki, when James never travelled. So, despite not being on the pitch tonight, David can still lay claim to an assist of sorts, having spurred his little brother into action! Our other goal was a cheeky little effort from out wide on the right from Chris Garrett, not disimilar to his goal away to the Belgian Paris Saint Germain Supporters' Club back in early 2007, over in Paris. It was good to see the team bolstered by both Gavriel Hollander & David Yuill from the 'Southwark News'; continuing a long tradition of their scribes appearing for us. And also Matt Pike, who 'guested' for us, having played against us recently for Ladywell FC. Yeah ,well I didn't take that many snaps. so have had to include some where I've missed the action! I'd better get out of the way of this! So this is him NOT saving a penalty! Oh dear! Darren really does like his photo being taken! Front row: (l to r): David Yuill; Chris Garrett; Lucas Green; Darren Nicolas; Jon Tennison; Matt Pike. Not in picture(taking photo): Mishi Morath.